Also known as the Land of Legends, the Lejre Research Centre is one of the most popular attractions in Roskilde. 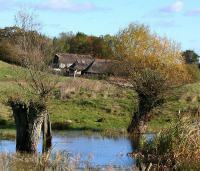 The centre is a 106 acre (43 hectare) archaeological open air museum situated just outside the city. The museum consists of amazingly lifelike reconstructions of an Iron Age village and sacrificial bog (200 BC to 200 AD), a Viking market place (900 AD), a Stone Age campsite (5,000 BC), and 19th century farm cottages. The Lejre Research Centre is high on the list of things to see and do with kids in Roskilde as there are so many fun and educational activities. You can cook food on one of the communal bonfires or bring your own picnic lunch and enjoy the beautiful surroundings. It's best to come prepared with good walking shoes and perhaps even a change of clothes because some of the activities can get you dirty or wet. The centre could easily occupy a family for a full day so be sure to allow sufficient time.